I wasn’t sure I was doing this right. It would be a 2 hour drive to Mansfield, for a run that would last 15 minutes. Not sure that’s the right way round. However, I’d been told there was cake so I was in. I’d run this race before and I had vague remembrances of mud, elbows and swearing that I would never do it again. I dismissed it. My memory is unreliable. I LIKE running. Besides it’s only 3km and that’ll take me a few minutes then I can go and find this cake that I’ve been promised. I was a bit concerned that I was in the wrong team. I liked my team mates but I was definitely the weak link in this relay. 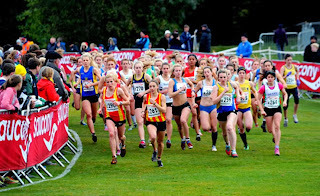 Emily was the club’s cross country star and one of their top ladies and was more than capable of a brilliant sub 18 time on a hilly 5k course. 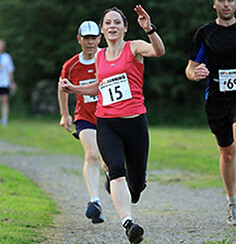 And Angela Copson who held multiple running WORLD RECORDS!. And me. Me who falls into ditches, is unreliable on any distance less than about 5 miles (and even then I stop to take pictures of alpacas) and who has done precisely 3 cross country races in her life. Including the one where I was 13 and gave up after ½ a mile. Although in my defence I started running again once I’d scored a sweetie off the marshal. We arrived in a field full of young people in running shorts and craggy old men with white hair and thick coats. The clatter of spikes, the queues for the portaloos and the sound of a horn signalling the start of a race. There was mud, wind, rain and enthusiasm. We moved through the field, a colourful mess of team tents, club colours and flags and finally found the team tent in the usual chaos of bags, unattended trainers and under 17s. And 2 giant boxes of strawberry shoelace sweeties. Brilliant. The weather was undecided so I wasn’t sure which shoes to go for so had brought my Salomon Crossfire 3 and New Balance spikes although it was the first time I’d raced in these. I asked the more experienced runners what they’d recommend and the result was unanimous – spikes. My nervous energy was keeping me warm as I jittered from one foot to the other. Emily was on the first leg of the relay and was running the first 3km. We ran a warm-up together and decided to run the lower half of the circuit. We got just to the open part by the lake when the skies opened. It was the throw-a-bucket type rain which meant you were drenched within 30 seconds. Oh well. At least if I fell in one of the bogs I’d already be wet. Walked up to the starting pens with Angela and we caught sight of Emily waiting to go. We waved and bellowed to wish her luck. They called them all through onto the field, the gun fired and they were off in a jostle of elbows, spikes and flying mud. I had 2 seconds warning of Emily coming in. Checked it was her then dashed through the hordes of girls in front of the line and pegged it across the line. Run as fast as I can while trying to keep pace maintainable. Overtaken by the first person. Crap. Don’t try to catch them now, pick them up near the end when they tire. Just keep running. Check Garmin – am running at 5:56 min/miles. Crap, can’t run at 5:56 min/miles. Passed by second girl. Crap crap. Splosh through a boggy muddy bit. Wet feet. Just keep running. Ooh into the woods. More mud. Round the duck pond. Where are the ducks? Mud! Argh! More people coming!! Just run Sarah! Don’t let Emily and Angela down! Argh! More mud. Stupid wrong spikes don’t have much grip and feet are doing spinning roadrunner impression. Up the hill. Puff, pant. Ooh downhill. Argh slippy leaves. Uphill. More woods. Eyesight is actually going blurry. Am running as hard as I can in these conditions and with roadrunner spinning feet. Just keep running (to tune of Just Keep Swimming in Finding Nemo) just keep running. Ok, mustn’t kill self by going too hard now and fading at end but have to keep pushing. Out of the woods. Hooray!! Someone with a tannoy shouts “Go on Rugby & Northampton”. Feels as though I am running in slow motion but going fast as I can. Stupid uphills. Stupid running. Push push. Just keep running. Stupid grass. More woods. Stupid woods. And downhill!! Stupid downhill. Legs hurt and it feels as though eyeballs are bleeding. Just keep running and final uphill. Girl just in front. Must overtake her. Stupid slippy hill. Push push and there’s the finish!! Phew! Can sit down. Sit down. Check eyeballs. Relieved to find not in actual fact bleeding. Legs appear intact despite what senses are telling me. Stupid short distances. Stupid cross country. And it was raining. Cheered in Angela and got back to Rugby & Northampton tent. Which wasn’t there. 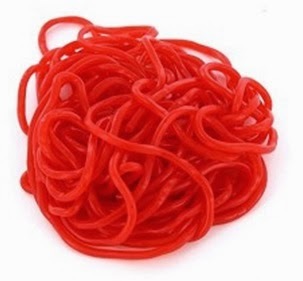 It had been taken down in my absence and some git had eaten all the strawberry shoelaces. Walked back to the car and stopped at the stall to buy a ‘English National Cross Country Relays’ hooded sweatshirt ... which was now only available in 14 – 15 years. Sigh. Got to the car and finally started getting feeling back in my hands. My face returned to a normal colour and my vision started coming back. Love it as always :) great time !!!! Thank you! I tried so hard but was outclassed!! It felt like a sprint to me - think I'll stick with the nice long distances where I can have a good look around and not feel as though my brain is pouring down my nostrils ;) How's the foot now? Thanks Taff! 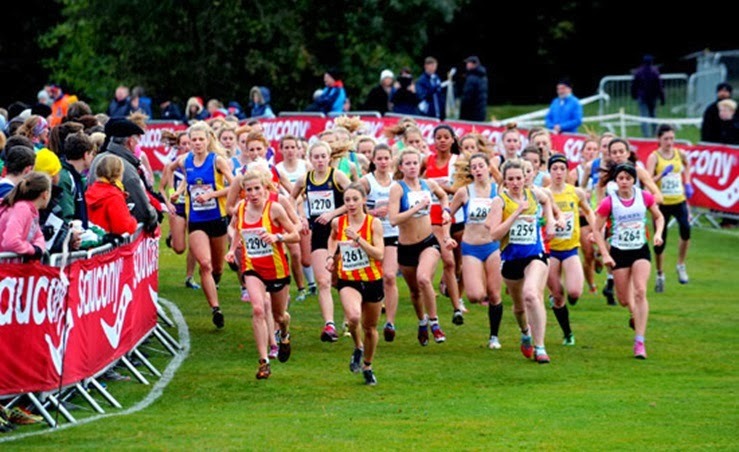 Is it normal for cross country races to feel like that?? !